Using the System Upgrade utility, a wizard that walks you through the upgrade step by step; continue with this topic. Use this method if you don’t have a to the Magento server’s file system or if you’re a non-technical user. Be noticed that This upgrade method is more advanced and it requires access to the Magento server’s file system. System upgrade refers to updating the Magento 2.x core components and other installed components. To migrate from Magento 1.x to Magento 2, see the Migration Guide. Authorization keys from a shared account cannot be used for upgrade. You must get your authorization keys from magento.com account owner. If you installed the Magento application by cloning the GitHub repository, you cannot use the System Upgrade utility to upgrade the software. Instead, you must update it manually. Ownership determines who can perform actions on the file system; permissions determine what the user can do. drwxrwx---. 12 magento_user apache 4096 Jun 7 07:55 .
drwxr-xr-x. 3 root root 4096 May 11 14:29 ..
Before continuing, complete all tasks discussed in Prerequisites. 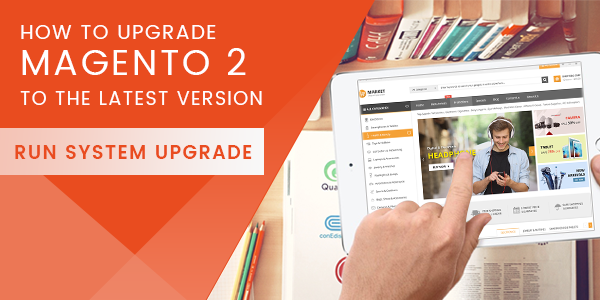 If you're upgrading to version 2.1, see Upgrade to Magento version 2.1 (June 22, 2016). During the time you’re upgrading, your storefront is partially available. Users can see a list of files and so on but cannot shop or check out. To avoid the appearance of a disabled site and to set up a custom maintenance page that displays during the upgrade, see Maintenance mode options for upgrade. Click System > Tools > Web Setup Wizard. The following page displays. If you haven’t already done so, enter your authentication keys in the provided fields. The following figure shows an example if you have already entered your keys. The page displays similar to the following when we find components to upgrade. Continue with Step 1. Select versions to upgrade. For suggested solutions to other causes indicated by this message, see troubleshooting. How To Fix Theme Switching Error Message In Magento 2.2.4?